On Friday evening in the residential neighbourhood of Isla Vista in Santa Barbara, California, 22-year-old Elliot Rodger stabbed his three young Asian American housemates – George Chen, 19 , Weihan “David” Wang, 20, and Chen Yuan “James” Hong, 20 – to death while they slept. 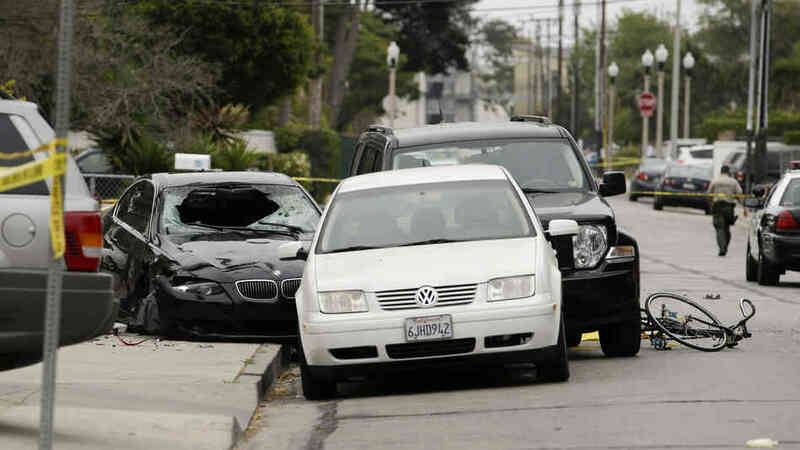 Rodger then drove his luxury BMW coupe to the Alpha Phi sorority where he opened fire with two legally purchased handguns on three female passersby; two – Katherine Cooper, 22 and Veronica Weiss, 19 – were killed, while a third is recovering in hospital. Rodger proceeded to the nearby I.V. Deli Mart and fired randomly into the store, killing Christopher Michael-Martinez, 20. He then drove through the streets of Isla Vista, shooting randomly at pedestrians and striking two cyclists with his car; by the end of the night, he had wounded 13. A brief firefight ensued between him and sheriff deputies, which ended when Rodger crashed his car into another vehicle. Rodger was found dead in the drivers’ seat of an apparent self-inflicted gunshot wound to the head. By Saturday, several YouTube videos created by Rodger – including one uploaded just hours before the attack that appeared to offer a motive for the deadly shooting – were discovered, along with a 140-page autobiography-turned-hate-fueled-manifesto. These items, along with Rodger’s frequent posts on BodyBuilding.com and PUAHate.com forum boards paint a disturbing – and disturbingly detailed – portrait of a narcissistic, mentally disturbed, lonely, woman-hating man-child so deeply twisted by American racism, classism, and sexism that he found a way to rationalize mass murder. Sparked by an abundance of macabre primary source material, over two hundred thousand news articles and think-pieces have now been written about Rodger (according to Google’s latest count) and the feminist hashtag #YesAllWomen – initiated in response to Rodger’s documented misogynistic motives – remains one of the top 5 trending topics on Twitter. I have over the last four days stayed silent on the UCSB shooting as I tried to parse my own thoughts on Friday’s violent attack. I watched some of the YouTube videos and read Rodger’s manifesto. In the end, I couldn’t shake the same chilling reaction I felt when I first read about Friday night’s violence: I had seen Elliot Rodger’s brand of radical hatred before. I had seen it within the comments section of my own site for a decade. I had seen it from members of my own community.